So, here are pictures of my not so cute hands and feet. I'm not sure if the pictures do them justice, but they are quite swollen. The only thing that really bugs me about it, is that I cant fit my wedding ring on my finger! See how my finger has a permanent indention in it where my ring should be? I miss wearing it..... It wont be long though. I cant believe I will be 34 weeks tomorrow!!! Callie is doing a pig for 4-H this year! She has been wanting to do one for a few year's now. So, after much waiting, she is finally getting to experience the joys of stepping in pig poop, remembering feeding times, and all the other smells and fun things that come along with having a pig. Luckily, she seem to be enjoying all of it. Tyler and Eric are also having fun with the pig. Tyler loves to get in the pin and help her feed it. While, Eric and I watch all the action from the car. Callie named her pig "Hammy" (Hammy is a boy pig). If all continues to go well, Tyler will do a pig next year when he meets the age requirement. He is quite excited about that! I cant believe that I've been a mom for over 12 years now! It has gone by so fast!!! I really am so thankful to have Callie in my life. She is a good girl, and tries hard to do whats right. I feel like I'm a better person because of her. On her Birth Day we had some family come over for a late lunch and cheesecake (Callie's favorite). She even put her own candles on her cake (nice job Callie). That night her friends, Emma and Jennifer came over to stay the night. The next day I took them to Show Low to get their toes painted, then we ate pizza, went bowling, and topped the trip off with ice cream. I hope you had a fun day Callie, Happy B-day.... I love you so much! 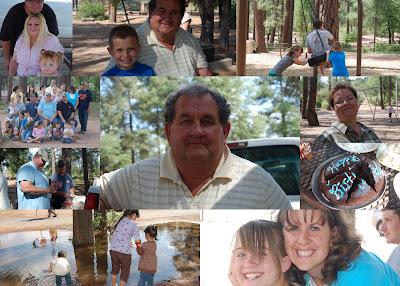 For my Dad's 60th b-day we all met at a park in Payson, which is a good halfway mark for my siblings (some came from the Mesa area, and some from Cottonwood). Anyway, we met and had a little picnic. It was so fun to see everyone. I hope you had a good time dad.... Happy Birth day!!!! This summer we are doing some landscaping!!! For the past couple of weeks Brian has been working on our sprinkler system. Hip hip hurray! I cant wait to run around on soft green grass without any shoes on (sigh). It will also be so nice to have a dirt free place for our kids to play (sigh again). We originally got a quote to have our yard landscaped by a company out of Pinetop. It would have been around $13,000.00 to sit back and have some one else make our yard look beautiful. Needless to say we decided to go the cheaper rout and do it our selves. Although, we couldn't have done it without the help of Nathan Western, who has spent much of his free time here helping us out. He has been so great. Next year we hope to add some trees and planters to our yard. We don't want to get in over our heads financially, so we plan to do it little by little. 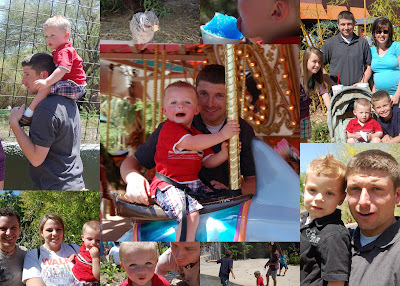 I took these pictures of the kids Easter afternoon, right after church. They were each sporting a new Sunday outfit. After I took their pictures, I ran inside to finish making dinner. We had quite the group for dinner, which included a big portion of my family and also Brian's mom. We all had a really great time! 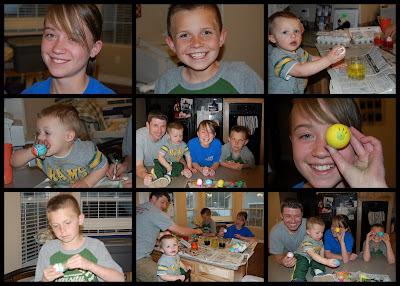 Here we are decorating EASTER EGGS!!! 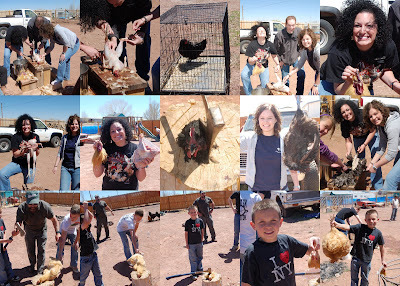 We did it the Monday before Easter for FHE. I manned the camera while everyone dipped, colored and tried not to break the eggs. A few eggs were broke.... but it was a small price to pay for a good time! I feel so bad that I took such a long vacation from blogging! I'm going to do my very best to get caught up this weekend. So many things have been going on in our lives. First, I'll start with a pregnancy update. I am 32 weeks along!!!! I cant believe that in just a few short weeks we will be meeting this little guy. Its weird because on one hand I can hardly wait to be on the other end of my pregnancy, while on the other, I wouldn't mind being pregnant for another 6 months (and its not because I love all the discomforts of pregnancy)!!! I'm just a little apprehensive about the EXIT. I'm also nervous about what life with a new little baby will be like. I'm sure it will be wonderful to have a new baby around..... but will I do a good job with everything? Will I be able to balance a newborn with all the other things I'm responsible for? (I worry about this stuff a lot in the middle of the night). As for the pregnancy, everything is going really good. I had a few problems in the beginning, but thankfully they seem to have been resolved. I still have a lot of contractions, but I'm beginning to think that these contractions are normal for me. They don't seem to be doing anything though, so I'm not that worried about them. When they get extra bad I try to lay down for awhile. I'm also seeing a Endocrine Doctor for my pituitary glan. I have a little tiny tumor on it called a micro adnomia. I've had it for the past 7 1/2 years (that I know of) and its never been that big of a deal, other than causing minor hormone problems. I guess that these type of tumors can be a little unpredictable during pregnancy though, so its needs to be monitored a little closer. If it grows I will have to start taking medicine to shrink it right after I have my baby, which would keep me from being able to nurse. If it doesn't grow, I'll be able to nurse for the first two weeks, then I'll have to get an MRI to see how nursing is affecting it. If it still hasn't changed, I can keep nursing.... I really, really hope I can! We have also picked out a name for our little guy....... We are going to name him Jacob Ian. It feels so good to have a name for him. I love how Eric refers to him as "baby Jake". Brian (being his sarcastic self) says he might change is name when he blesses him. I cant imagine him really doing it, but it is kind of funny to hear him joke around about it! P.S. Donna showed these links to me. They are funny songs by Hillary Weeks. I LOVE her!! !